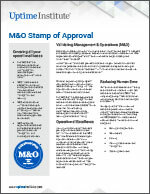 Abstract - M&O criteria were developed by and for the data center industry, rather than a re-interpretation of standards originating in other industries. M&O provides third-party assurance that the site management satisfies industry-recognized criteria for 24 x 7 uptime. The review and findings report aligns resource allocation with facilities performance to minimize human error and to obtain maximum leverage of the installed infrastructure.